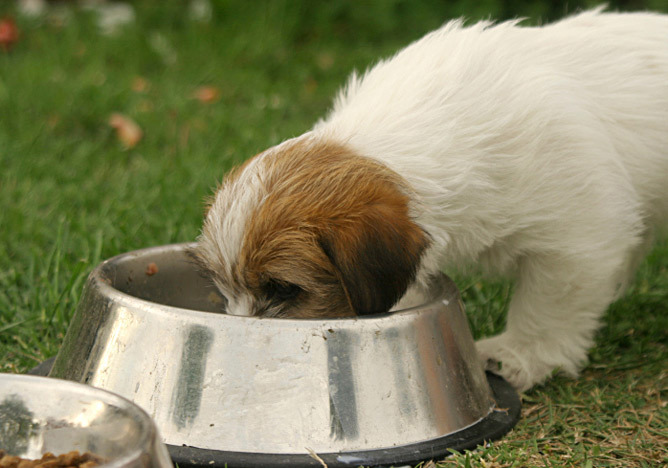 (Q) What are the most important considerations when feeding a puppy? How much and how often should I feed him? I've just acquired a 12-week-old Cocker Spaniel and I'm keen to feed him the best diet to keep him healthy and in optimum condition. (A) Vet Susan McKay says: While your puppy is young he will need more frequent meals, but as he grows older these can gradually decrease in number. Up until around 12 weeks old, he'll need four meals a day of a good-quality, complete puppy food; after 12 weeks, this can be reduced to three meals a day, and changed again, at about 16 weeks of age, to two meals. Switch over to an adult formula diet when your pup is a year old (if he's a smaller breed), or 18 months if he's a larger breed and therefore slower to reach maturity. Your puppy shouldn't be skinny, but neither should he be allowed to become overweight. Research has shown that fat puppies become fat adults, who are at risk of a whole range of associated health problems. Each dog is an individual and the amount they need to eat depends on their level of activity, their lifestage, and their individual metabolic rate. The first six months is a period of very rapid growth and you would expect a puppy to be consuming more calories during this phase than an adult dog of the same size. The feeding amounts you see on the back of a pet food bag are only guides. This is because of our dogs' fantastic capabilities for individual variation. The key is to look at your puppy's body condition. Ask at your local veterinary practice to speak to a veterinary nurse who will be able to show you how to assess this. Your vet should weigh your puppy at vaccination and most now offer a junior check. They should also give you feedback at these times as to whether your puppy is underweight or overweight. Pups increase their bodyweight by a factor of around 25 in the first six months of their life. By this time they should be about half their adult weight and at the end of their most rapid period of growth. Appropriate levels of food and exercise are essential for the development of a healthy dog. Too much or too little can cause health problems. Some breeds of dog may have particular nutritional requirements due to underlying genetic disorders.